First day, attached to a post. The rope on the ground is a temporary drag rope—I only use this for a few days, until she lets me catch her halter. At first I need a handle because she runs away from me. The wood walls are just to keep her from getting her hoofs caught in the fence during the initial tantrums. Leading up to Weaning Day, however, is halter-and-lead-training, or Calf School. 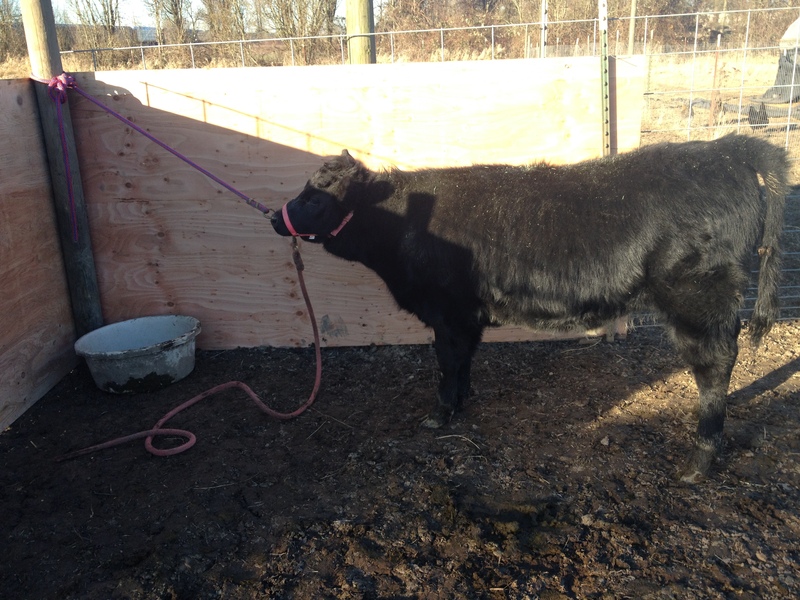 The calves all get dressed in a halter, and learn how to politely walk with a human. This begins with being tied to a stout post or handle on a wall—there is always a tantrum involved, when the calf first figures out that they are attached to said post. A calf tantrum involves a lot of gymnastics and at some point they look like they are dying or having a seizure. They’re not, it’s an act. But, it’s a lot easier on the human trainer’s arms if they do this tantrumming on something immovable. I like to hang out for a while, peacefully talking about whatever is on my mind while they do the tantrum. Sometimes I walk away and come back, like a toddler time-out. But they’re not being punished, it’s a lesson. A half-hour is usually enough at first, and then they are given back to their mom, so they learn that it’s all ok. Eventually I let them eat while they are tied and they figure out it’s really not so horrible and doesn’t last forever. Then, I can start leading them in a small enclosed space. It’s pretty interesting when your buddy gets new clothes. In this case, Matilda got a pretty pink halter and Hemi the steer is checking it out. Weaning Day was supposed to be last week, but then it got SO cold, I just couldn’t do it. I mean, weaning is traumatic enough—why make it worse with below freezing temperatures? It felt a lot warmer today, and it’s supposed to be above freezing tomorrow, so I moved everyone around—calves in the new pasture, moms in the barnyard, near the milking room. Better while the ground is still frozen—once it starts defrosting, the mud will thaw and it will be hard for both of us to gain traction in the slippery road. All was well, the bellowing began, but that’s normal and continues for a few days. There’s really not much you can do, they have to grieve a bit. (Important to realize here, that these calves are 6-7 months old, and more than old enough to leave their moms.) However, as the snow started to fall, somehow the calves broke out of their fence. Luckily the front gate was closed, so they couldn’t wander into the road. We learned that lesson many years ago. Keep it closed, just in case. It didn’t take long to realize that it was just too slippery in the snow to try and catch-up and walk those not-fully-trained calves back to their pasture, so they ended up in the paddock with the donkeys, who were very freaked-out and not pleased. The bottom line is that the naughty calves are out in the snow because they broke out of their pen, and the moms get the barn because they need to be milked. The donkeys are back in their shed because they didn’t do anything wrong either. Sometimes we just need to make these decisions. Tomorrow we will work toward getting everyone back where they belong, but for tonight, the weaning will probably be easier on all involved (even if they are out in the snow) because they can sniff each other through the fence. There’s still bellowing and mooing involved, but not from one side of the farm to the other. I’m not sleeping with my window open tonight though. And tomorrow, we will have sweet Dexter milk from Beauty. 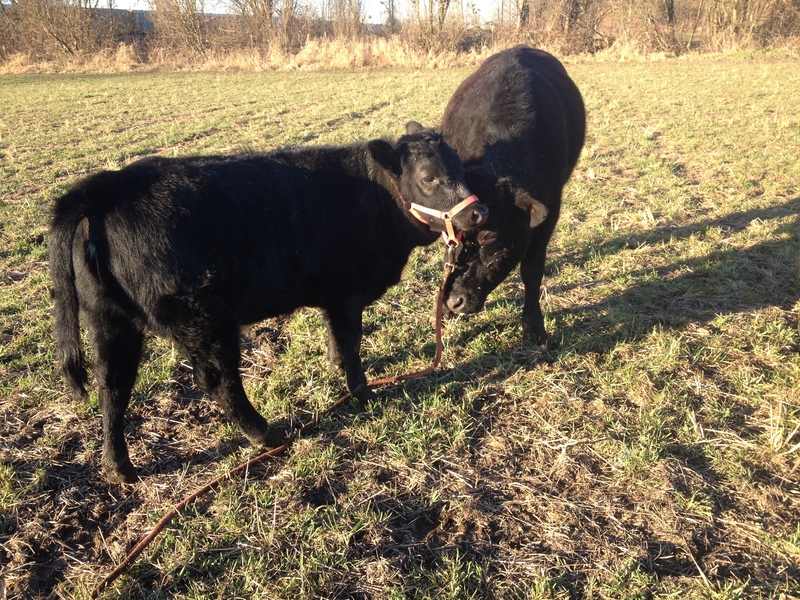 This entry was posted in Uncategorized and tagged Calf Weaning Day. Bookmark the permalink. What a great picture you’ve painted. Life sure is lively on the farm… Those naughty calves:).